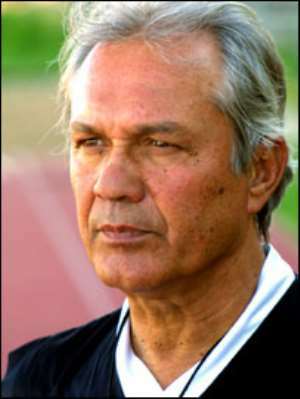 The appointment of former Rwanda coach, Ratomir Dujkovic is seen as one of the few right steps that the Ghanaian Football Association has taken in the past few years, following the calamitous failure to qualify for the Nations Cup finals in Tunisia and the fact that the Black Stars are still searching for their World Cup ticket. For Ghanaian football fans, it is inconceivable that their national team has never been to football's biggest spectacle. But that is the truth. And after more than five coaches in two years, the average ball fan simply lost hope in the ability of the present corp to put in place the right pegs that would ensure Ghana landed in Germany in 2006. The fact that the qualifying campaigns have been lumped together with those of the African Nations Cup this time, making it much tougher. After winning the African Nations Cup four times ( a record they share with Cameroon and Egypt), Ghana are tired of playing in the continental showpiece. What the people want, and where they want to see their team, is the World Cup finals. A ticket to the World Cup has become even more difficult to earn, with only one team out of six in each of the five African qualifying groups to make it to Germany. Coming tops among six teams is not something you can achieve if you don't start your race well. And Ghana sure failed to start the campaign well last year. Travelling to nearby Ouagadougou, the Black Stars fluffed a golden opportunity to pick three points at the block, falling 1-0 to the Etalons. It was a silly conduct, and Portuguese coach, Mariano Barreto's excuses did not wash with the ball fans back at home. However, with Stephen Appiah, Stephen Oduro and William Tiero running riot, the Stars rescued the second match, scoring three against the Bafana Bafana of South Africa in Kumasi and barricading their rear against Bafana marksmanship. The three points were well earned, but as they prepare for the resumption of the series in March, with a trip to Democratic Republic of Congo, the four-time African champions will pray they do not regret that misdemeanour in Ouagadougou at the end of the campaign. For, in their effort to make it to Tunisia 2004, they had to play only Uganda and Rwanda in a depleted pool. They beat Rwanda in Kumasi but could only draw with Uganda, and lost in Kampala. On the final day, they needed a draw against the Bees in Rwanda, but were pole-axed when Jimmy Gatete scored in the second half. Ghana had gone to Kigali with their best players, and yet they failed. The rascally changing of coaches at the drop of a ball, did not bring any changes in fortune, and Ratomir Dujkovic met a Black Stars team that could only draw 0-0 with DR Congo in Kumasi in their last match and have fallen behind South Africa (their victims in June) on the group B table. The failure to win in Uganda is also blamed on the musical chairs, not only of coaches, but of players. While some of the custodians of the Ghanaian team have preferred only home-based players with a couple of foreign-based, others set much store by the foreign legion. At this juncture, it is unclear which is the better equation. Some 18 months ago, Dujkovic qualified Rwanda for their first ever Nations Cup finals, leading them in that famous 1-0 win over Ghana in Kigali. The Bees also swarmed over Uganda and won 1-0 in Kampala against the bitter neighbours. But the federation, despite a credible debut at the Nations Cup in Tunisia and a bright future ahead, fell out with Dujkovic and did not renew his contract when that was due in August last year. Dujkovic is a mentally sound Serbian with good knowledge of the game and a patient, calculating tactician as shown in his team's narrow loss to Tunisia in the opening match of the Nations Cup, their draw with Guinea and defeat of Congo Democratic Republic. He has come at a time that Ghanaian football received a shot in the arm, with two clubs, Asante Kotoko and Accra Hearts of Oaks, making it an all-Ghanaian Final in the CAF Confederation cup last month. Dujkovic can pick so many good players from the two clubs with a tradition for excellence. Kotoko have played in nine different finals of African competitions since the 1970s while Hearts have now won the CAF Champions League and the Confederation Cup, as well as the Super Cup. They have brought back their 'super coach', Cecil Jones Attuquayefio, who took Benin Republic to their first African Nations Cup in Tunisia last year. Attuquayefio, who played in two Nations Cup final matches consecutively, and was in the team that won the 1965 championship in Tunisia, has done so well that most Ghanaians ask why he would not be given the job of Black Stars coach. The only time Attuquayefio has been put in charge of the national senior team, he was heaved out for reason of 'serious differences' with the federation after only a few months. That was in 2001, with the qualifying games for the 2002 World Cup in full swing. This time, Coach Dujkovic must be sure to employ more of the home-based, who displayed mental and tactical balance and acumen in the two-leg Confederation Cup final earlier this month. There are players like Stephen Oduro, Michael Osei, Frank Osei, Charles Taylor, George Owu, John Hendricks, William Tiero, Michael Donkor, Bernard Don Bortey, Prince Tagoe, Louis Agyeman, Edward Copman, Mireku Amankwah and Sani Mohammed who can effectively combine forces with the foreign legion as represented by Stephen Appiah, Michael Essien, Sammy Adjei, Sammy Kuffour and Derek Boateng. In a pool that has South Africa, Uganda, Cape Verde, Burkina Faso and DR Congo, Ghana should be competing only with the South Africans. That is actually what is happening now if you look at the table. But the truth is, the Black Stars are at par with the Congolese Simba at eight points and the fact that both teams clash in Kinshasa at the end of March is something Dujkovic has to take seriously. The Simba have an axe to grind against Dujkovic for leading Rwanda to beat 'the big brother' in Tunisia. Having held the Black Stars to a draw in Kumasi, war-weary Congo stars will want to make the best of the opportunity to go second on the table and firm up a place at the African Nations Cup finals in Egypt, even if they can't hope to qualify for the World Cup. However, the prospect does not look exceedingly bright for the Black Stars. In the first half of the race, they played three of their five matches at home. That means they must play three away from home out of the remaining five. Those three games are in Congo, South Africa and Cape Verde. It's not looking as good as it should, and Ghana, with their incurable propensity for shooting themselves in the foot at the crucial turn in World Cup series, could just end up doing that again. The Congolese national team is not doing as well as it is doing presently not because the players are not there, but because of terrible worries at home and the nauseating habit of team captain, Lomana Tresor Lua Lua, to get into trouble at every facet of the game. Politically, the Simba should not even be playing. A civil war at home has made life difficult for all and apart from the senior team, the government has withdrawn other teams from international competitions. The situation is so bad that the foreign-based players are not at ease playing for their nation because they have no idea of what would happen when they fly into the country for camping and grouping for an away game or for a home match. Lua Lua, who got into a fit during a match against the host nation at the last Nations Cup finals, and ended up collecting a red card for his indiscretion, was banned for four games by CAF and that started with the World Cup qualifiers. He would probably start with them against Congo DR in Kinshasa in March, and perhaps, Monaco striker, Shabani Nonda, can then join forces to make things work the Simba way. Nonda was lambasted for not showing up to play for country in the past two years, even when he was fit, though most of the time he had been injured. He only played a bit part in Monaco's run to the Champions League Final last year, which they lost 3-0 to FC Porto. During the week, Nonda was reported as being ready to join up with the Simba once more, and should Lua Lua stay out of trouble (he is currently serving yet another suspension for a number of matches in England), both can make life difficult for South Africa, Ghana, Burkina Faso, Cape Verde and Uganda in the last half of the campaign. Too many times, Congo Democratic Republic have fantasized about their lone World Cup appearance in 1974. There is no great memory about their performance there, but at least, they were there. What many chose to remember is that they conceded nine goals against Yugoslavia and were pounded 3-0 by Brazil and Scotland. What the average Congolese chose to remember is that DR Congo played in the World Cup. That lone World Cup appearance was, incidentally, in Germany, the hosts of the 2006 finals. Can the Simba make it there this time, 32 years after, and with the team presently perched in third place? Last year was a busy term for the Congolese, who were in the spotlight for so many wrong reasons. Team coach, Claude LeRoy, threatened to quit many times as the federation failed to fulfill contract terms and negotiations headed for the rocks. With so much money being spent on curtailing the advances of different rebel groups into the cities, it took President Joseph Kabila some time and some quick thinking to sort out the differences with the Frenchman. Of course, the Simba are the only positive mention for Congo DR in the international sphere, and should the team stop playing for whatever reason, the flood of negative reports could drown the big but hapless nation. To reach Tunisia 2004, the Simba emerged victorious in a pool that had Libya, Swaziland and Botswana, the Libyans coming so close to piping them to the tape. At the finals, they were coached by Englishman Mick Wadsworth, a former assistant coach of Newcastle United of England (under Bryan Robson) and coach of third division team, Huddersfield Town. After the team crashed out at group stage in Tunisia, and taking one look at the mighty mess that was on ground, Wadsworth failed to fly back to Kinshasa with the contingent, opting for the two-and-half hour trip to England instead.